A gurney bearing injured worker Apolinar Fermin Barcenas is pulled into a helicopter from a construction site last June. Decco Construction Inc. of Fullerton contested the alleged violations, 11 citations carrying fines of $85,500, on Nov. 30, according to a penalty notice from the Occupational Safety and Health division of the state Department of Industrial Relations. Decco was given until Nov. 7 to correct four of the violations, which were issued Oct. 24, but missed the deadline, said Lucas Brown, a department spokesman. The other violations were corrected at the time of the inspection. Company owner David Eminhizer did not return phone calls seeking comment about his decision to file an appeal. 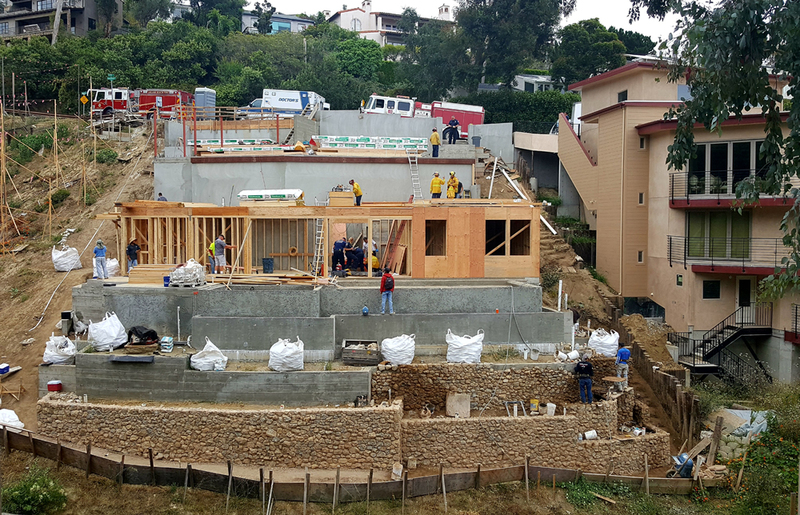 General contractor Ken McMurray, of Laguna Beach, also was cited for five violations, which he also appealed earlier this month. “It is a painful, emotional process to be involved in a fatality,” said McMurray, who plans to represent himself in the appeal and expects to be called before a panel of three OSHA board members soon. None of the violations were described as contributing to the death of Apolinar Fermin Bercenas, 60, of Pomona, a 27-year employee of Decco, who fell from the second level of a hillside home development on Diamond Street. “There was no determination of negligence,” McMurray said in an interview this week. Six of the Decco violations are categorized as “serious,” including a lack of stairways between floors for worker use, exposed anchor bolts and unsecured ladders, the notice said. Other violations were annotated as “general,” such as a failure to train employees on fall hazards, and “regulatory,” for failing to post a code of safe practices. Last June, Eminhizer and McMurray both said the job site’s lack of a formal access stairway for use by workers is not atypical of hillside construction. Temporary stairs were in place on both sides of the structure, McMurray said. McMurray was also issued two “serious” violations that mirrored the Decco citations for a lack of temporary stairs prior to erecting walls on the second story and for failure to place protective orange rubber caps on anchor bolts. That latter is a requirement McMurray said he was unaware of and noted that the caps were in place on rebar protruding above grade. His company was also cited for three “regulatory” violations, which included lack of a permit that McMurray said he was unaware was required and two others that he said were unwarranted as he was already in compliance with the regulations. Eminhizer, who was on the job when the accident occurred, speculated at the time that Fermin had suffered a heart attack or stroke because he made no physical effort to right his posture as he fell. A coroner determined that trauma from the fall caused Fermin’s death. Cal-OSHA inspectors interviewed witnesses June 9, two days after the accident, and imposed no restrictions at the job site at the time, said Peter Melton, of the Department of Industrial Relations. Last year, 53 construction workers died on the job in California, according to the Department of Labor website. 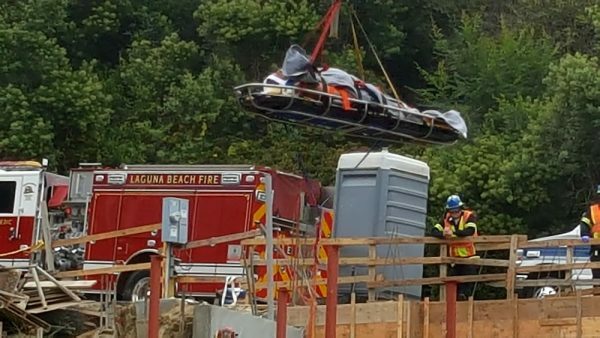 City building officials did not return calls about construction accident rates in Laguna Beach. A spokesman for the Construction Building Industry Association says the organization does not compile statistics on OSHA violations. Due to limited resources, OSHA regularly inspects 5 percent of construction projects annually and excludes single-family housing, the Department of Labor website says. About a third of 936 construction industry deaths nationwide in 2015 were due to falls, the website says. Failure by contractors to provide fall protection was the most common citation issued in 2016, said an OSHA report. Eminhizer’s appeal is on hold pending a review by the Bureau of Investigations, Brown said. His hearing will be scheduled when the investigation concludes, Brown added.